Introduction - Explain briefly in your own words what the information shows. Give more detail than the question and make comparisons where appropriate. Main Body - Decide how to organise your paragraphs. For example, in the model answer below, paragraph 2 is about 1940-1970, paragraph 3 is about 1970-2000 for Columbia and Yamhill, and paragraph 4 is about 1970-2000 for Washington. Use words such as although and however to make contrasts, and words such as likewise to introduce similarities. Always include the actual data you have been given. The final paragraph is not a conclusion in this type of task. 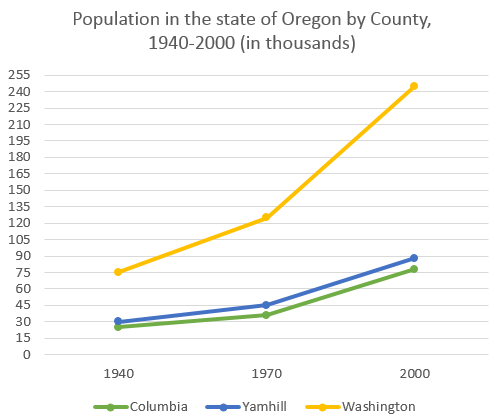 The graph shows the increase in population of three counties, Columbia, Yamhill and Washington in the U.S. state of Oregon, between 1940 and 2000. In 1940, Columbia had the lowest population of the three counties, at around 25,000. This compared with about 30,000 in Yamhill and approximately 75,000 in Washington. By 1970, Columbia’s population had risen to just under 36,000. Although this appears on the graph to be a gentle increase, it is in fact an increase of approximately 50%. Yamhill’s population also rose by nearly 50% between 1940 and 1970: from 30,000 to just under 45,000. However, the greatest real increase was in Washington, where the population in 1970 had increased by approximately 75,000, to 125,000. The years 1970 to 2000 saw the populations of Columbia and Yamhill increase by approximately the same amounts that they had increased by the thirty years before. In 2000, Columbia’s population – at approximately 76,000 – was triple what it had been in 1940. Likewise, Yamhill’s population, at around 90,000, was almost triple what it was in 1940. Although Washington’s increase in population between 1940 and 1970 was large, its increase in the following thirty years was even sharper, rising from about 125,000 in 1970 to more than 240,000 in 2000.